Filmmaker Says 'Nerd Prom' Has Grown to Reflect Poorly on D.C. 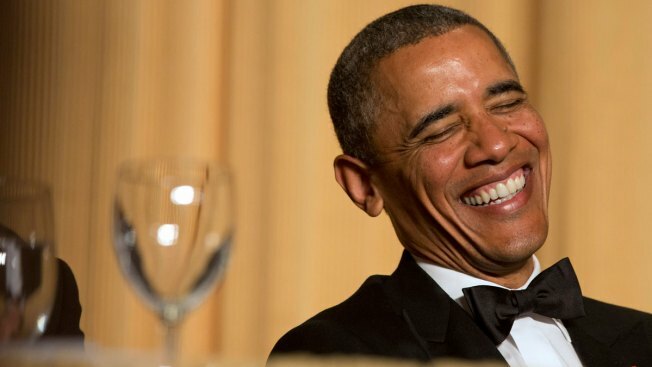 FILE PHOTO: President Barack Obama laughs during the White House Correspondents' Association Dinner at the Washington Hilton. A former Politico journalist is poking a hole in the bubble that surrounds one of Washington's biggest, celebrity-obsessed weekends with his new documentary "Nerd Prom." The film by Patrick Gavin, released online this month, takes a critical look at the White House Correspondents Association dinner and the slew of parties and VIP receptions that now span several days around the main event. The official dinner draws the president to the stage to make some jokes, and many attendees spend the night posing for selfies with celebrity guests. This year's dinner is set for Saturday. Film producers plan to release "Nerd Prom" on iTunes, Amazon and Netflix in the coming months. Gavin spoke with The Associated Press about how he found the dinner that honors journalists and raises money for scholarships has drifted from its original purpose. AP: What did you set out to do with this film, and what turned you toward critiquing this event? Gavin: It had really become Washington's signature event. For me, whatever the signature event is in one of the world's most powerful cities I think bears some research. I definitely wanted to do some real reporting on it. The thing that made me make a slight 45-degree turn more critical was as I was interviewing everybody, it just sort of dawned on me that all the things the weekend was supposed to be about -- White House correspondents or scholarships or even fun -- just weren't really holding up. ... I just kind of realized the bottom was falling out of this weekend. And then of course, that leads you to say, "well, if it's not about those things, then what is it about?" AP: How long has it been this way? Gavin: Everybody kind of pegs it to around the 1990s when celebrities started coming and the introduction of the red carpet. And that's certainly true that that was a game changer. But from my perspective, it's really been in the past 10 years. I remember when I started, it was really four events. There was the dinner, one after party, maybe one brunch. And now businesses have really changed it in the past 10 years. Now you've got 25 parties; you've got corporate involvement like you've never seen before. AP: Is there anything wrong with Washington having a little fun? Or is there something else going on here that you found unseemly? Gavin: My real issue is not with the dinner. It's not with not getting invited to parties. It's not with corporate sponsorships. ... My issue is with this being our Super Bowl. My issue is with this being our No. 1 event every year, simply because this is a town that's not supposed to be about self-celebration. It's not supposed to be about glorifying ourselves and doing well by ourselves. It's about doing well by others, making the world a better place. AP: What kind of reaction have you heard since the film's release? Gavin: There's this whole thread of people in D.C. who sort of say "yeah, it's our biggest event, and yeah, it's kind of unseemly and gross, but it's dinner. Don't worry about it." That just struck me as incredibly cynical -- the fact that this town has a 10 percent approval rating. ... I think people in D.C. need to take greater pride in their town. And the only way they're going to get the respect of the people they are supposed to serve is to actually start caring about how we're perceived outside the Beltway.